Separation anxiety in dogs can be a difficult condition. This dog behavior problem is usually the result of a dog not receiving enough socialization as a puppy, but there can be other causes. 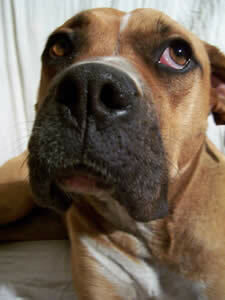 Dogs that have been abused may exhibit separation anxiety, as can dogs which have spent time in animal shelters. Any dog which is extremely sensitive or insecure and hasn't developed good coping skills may exhibit separation anxiety. Before you try to help your dog with a separation anxiety problem, you need to determine if your dog really has this condition. Separation anxiety in dogs is not quite as common as some people believe. The term "separation anxiety" is often tossed around and applied to dogs who actually have something else going on. For instance, if your dog barks and howls when you leave the house, chews on furniture and does other things to show his displeasure at being left behind, you might believe that your dog has separation anxiety. On the other hand, there is every chance that your dog is angry, upset, or just plain bored because he's left alone with nothing to do. Your dog may be a brat. This is not the same thing as having separation anxiety. Separation anxiety in dogs is a genuine anxiety condition, similar to an anxiety condition in humans. If your dog has this condition, he will exhibit similar symptoms when you are at home and out of his sight. If you get up and leave the room, your dog will be anxious. He may bark for you. He is probably glued to your side every minute. He can't bear to let you out of his sight. When you leave him home your dog may bark, cry, whine — and he won't stop even after you are out of earshot. Most dogs who bark and whine when people leave will stop after the owner leaves (though the owner may not realize this). If your dog has separation anxiety, he will not be comforted or distracted by having another person at home with him. Most dogs will be cheered up by having someone else at home with them. A dog with separation anxiety may destroy an owner's clothing or other possessions, trying to get comfort from them. Even house trained dogs may soil in the house out of anxiety. There is a definite difference between dogs that are unhappy or bored when you leave them alone and dogs that really have a mental condition. Can You Do Anything about Separation Anxiety in Dogs? Fortunately, yes, there are some things you can do to help your dog if he really has separation anxiety. Two forms of treatment are usually recommended: behavior modification and medication. These two kinds of treatment are sometimes used together. Before doing anything else, you should take your dog to the veterinarian to make sure your dog doesn't have anything physically wrong with him. It's always possible that an underlying physical problem could be contributing to your dog's behavior problems. If your vet rules out a physical problem, you can talk to him or her about treatments for your dog. Your vet may be able to recommend a canine behavior consultant to work with your dog, for instance. Your vet may also start your dog on medication to reduce the behaviors associated with separation anxiety. There are two medications that are usually used: clomipramine and fluoxetine. These medications generally take several weeks to really start working, so your vet may give your dog something else to work in the short-term. Any medication prescribed by your vet for your dog needs to be given exactly as prescribed. Do not skip doses or only give the medication when your dog shows signs of anxiety. The medication needs to be given at each regularly scheduled time for it to work. It has to build up in your dog's system in order to be effective. When you work with a behavior consultant on your dog's separation anxiety, you will work on teaching your dog to relax, desensitizing him to your leaving the house, helping him to become less anxious, and his other problems. You can help your dog by making sure that he's getting plenty of exercise. Tired dogs are more likely to sleep while you're away. This can also stop dogs from barking so much. Spend plenty of quality time playing with your dog and petting him when you are home. This can help your dog be more accepting of the time you have to spend away from him. You can also work on obedience training with your dog. This will help build his confidence and give him something positive to focus on instead of his anxiety. It can take quite a while to help your dog overcome a bad case of separation anxiety, so be patient when you work with your dog. Separation anxiety in dogs is a tough problem. But with kindness, consideration and dedication you can help your dog overcome the anxiety and live a normal life.